Built by SunBriteTV, this zinc-plated steel pole stand is compatible with nearly all TV sizes. Its dimensions are 3" W x 3" D x 62" H. It requires the purchase of a wall mount, which must be purchased separately (a SunBriteTV mount is recommended). It's specifically designed to be used outdoors, and it uses stainless steel hardware. 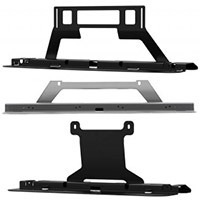 This heavy duty permanent outdoor TV floor stand INCLUDES an articulating mount for your TV, which allows the TV to rotate up to 180 degrees and extend out up to 12". It's 5 feet tall and the base comes in 2 sizes, 1' x 1' or 2' x 2'. 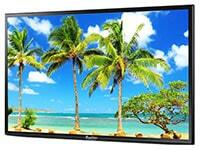 It's made with a black powder coating for weather resistance and fits TVs from 32" to 85". Compatible TV Sizes: 32" to 55"
Compatible TV Sizes: 37" to 65"
Compatible TV Sizes: 50" to 82"
This portable stand is made for your outdoor TV. All mounting hardware is included. With the smooth riding and lockable wheels, it will give you ultimate flexibility on your patio, deck or anywhere you choose. 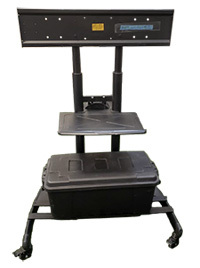 Warrantied to last a lifetime, these weatherproof tabletop stands fit all sizes of SunBriteTVs. They're made of heavy gauge powder coated aluminum (8 gauge /0.125" thick) for strength and durability.